Lugoj (Hungarian: Lugos; German: Lugosch) is the second largest city in the Banat heathlands and the district of Timiş. Today, approximately two to three percent of the population are native speakers of German and approximately ten percent of Logoj’s 50.000 inhabitants are of Hungarian origin. The settlement of the region with migrants from Bavaria, Moravia, Bohemia and Silesia began in the 18th century. First records of Lugoj stem from 1241, the time after the Mongol Invasion. In the mid-16th century, Banat belonged to the principality of Transylvania. In the late 17th century, Lugoj was the site of a battle between Habsburg and Ottoman troops in which the Habsburgs were defeated. In 1718, Banat went to the Habsburg regents after the Treaty of Passarowitz and Lugoj became the capital of Krassó County in 1778. On the left side of Timiş, colonists built the settlement „German Lugoj“. Two centuries later, Romanian Lugoj and German Lugoj were united. The German migrants mainly worked in agriculture and stock farming, in viticulture or as craftsmen. In the late 18th century, Lugoj was known as the most important wine area in the region. In the late 19th century, Lugoj became the centre of light industry, textile manufacturing and construction work. Hohl&Rotsching, Mercur Weavers and Edmund Höfer’s weaving mill are only some of the businesses which worked with Banat’s speciality: silkworm’s cocoons. 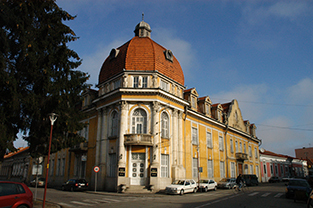 Today, Lagoj is a multi-religious centre which holds a Romanian-Orthodox deanery, a Greek-Orthodox episcopal church, a uniting diocese, a Reformist church, a synagogue and several Apostolic churches. Hollywood’s first Dracula actor came from Lugoj: Béla Lugosi. He used to be called Béla Blaskó, but later changed his name to resemble his hometown Lugoj. The city’s „grand church“ was built in 1766 and was presumably designed by Emanuel Fischer von Erlach (the younger) from Vienna. It is known as the most beautiful baroque church in Banat with its interior frescos by Anastasie Demian and iconostasis by Aurel Ciupe. Its floor is made from Kehlheim limestone and it is said that the stone came to Lugoj on horse-drawn carriages from Vienna. Opposite the church, the “Old Post Tavern” can be found. It is from 1726 and today holds the Roman-Orthodox deanery. Muschong Palace, built in 1927 by the owner of brick factory “Muschong”. 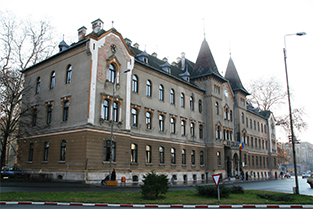 Lugoj’s town hall, built in 1903-1904.